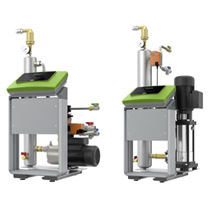 The Servitec series offers reliable protection against gas problems in small and large systems – through the active degassing of even dissolved gases. 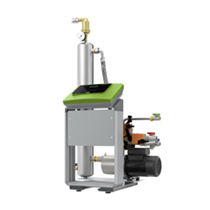 To do so, a partial flow of water in the system is removed, degassed in the Servitec under vacuum and fed back into the system virtually gas-free. Automatically controlled ball valves guarantee a constant flow regardless of the pressure ratios in the system. 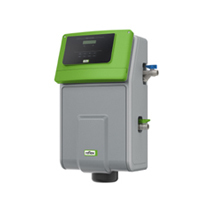 The standard range is adequate for system volumes of up to 270 m³. Vacuum spray-tube degassing for small systems, our ideal product for private houses. Suitable for offices and commercial buildings and technically demanding detached homes and apartment blocks. Due to an innovative nozzle and special software, this Servitec -gl version also overcomes water-glycol compounds, which are difficult to deaerate, like the ones used in undersoil heating, for example. Variable operating pressure and major capacity. 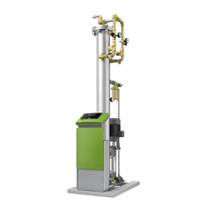 Even suitable for high-rise buildings and local heating or heating/cooling combined systems. The capacity and equipment can vary here. They are designed and produced to meet special customer requirements and have proven themselves capacity in many district heating systems.